I am in contact with several households each year and one of the questions I always ask is , “What is your preferred style?” Sometime this question is easily answered and sometimes it is not. The traditional people know for sure they are traditional and the contemporary people know they are contemporary but the other styles fall somewhere in the middle of all that. Most people will define their style based on what they see in advertisements. Retail stores like Pottery Barn and Restoration Hardware and Ikea have established a style all of their own. What is funny is that here in Ohio I find a lot of homes that have styles that are similar but are not publicized as a style. I am going to show you a style that I see a lot. If you don’t know your style, this may be you! The style is what I call the Transitional Midwest Style. Here in Ohio we have a lot of stained woodwork and most people either don’t want to paint wood or they don’t want to go through the trouble of changing all the wood so we work with it and all the lovely colors of oak . We like to mix the oak with black wood, iron, sage green, tomato or cinnamon reds and mix it with red brick. Many homes that are being remodeled mix in some painted woodwork as well. This home I helped remodel last year had Oak kitchen cabinets that were still in good shape so we chose to modernize the furnishings and freshen up the paint, add wainscoting to the hallway walls and do new window treatments. 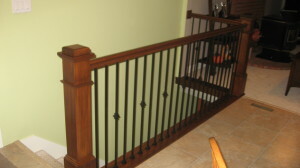 This railing was re-done and updated with the use of square posts in the cherry finish and black iron spindles. This one detail alone changed the whole feel of the dining room! The satin nickel oversize grommet top drapery panels and the Hunter Douglas 2″ Wood Blinds were added to the windows as well as a complementary paint finish to the walls. We also changed the fan/light combination on the ceiling to modernize the fixture. 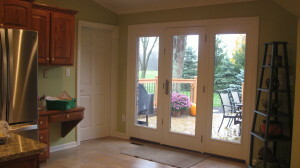 These doors were changed in the kitchen and I had the client change her trim color around the doors from oak to white so the doors would receed and open up the space. the wood shelving unit on the right side of the doors was painted black for her accessories. 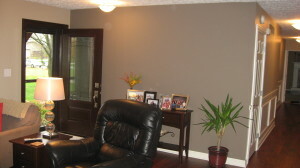 A two toned paint combination was used in this Living Room/ Entry to add dimension to the space and the darker color continued down the hallway. We did add a mirror above the entry table and a lamp after this photo was taken. Monin AfterIn order to add dimension and character to the long hallway we added a wainscoting and chair rail to the lower part of the wall. 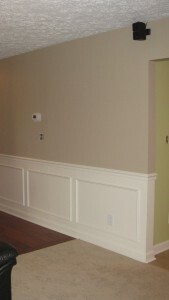 It made a huge difference and looked very nice with the natural wood floors and the carpet. Another project I just completed with the same theme was the remodel of a Master Bathroom. The home was built in the 50’s and we tore it down to the studs and discarded the vanity and started over. It was quite the transformation! 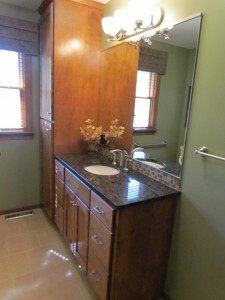 A new vanity with granite counter tops, sink, faucet, backsplash, mirror and light bar were installed by my crew. We also added a new tile floor which was installed on a brick lay pattern. There was a lot done to this bathtub/ shower. The side walls extended out about 4 inches into the room and I had those cut back. We kept the existing tub in place and tore out all the walls around it. New tile was installed in the shower and new faucets were added as well. 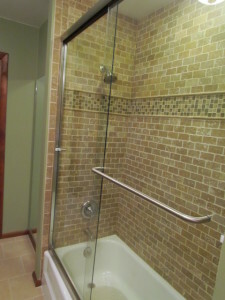 The glass shower doors were added last. We went with clear glass so you can see the beautiful tile work. 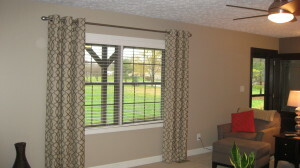 This mock roman valance was made to finish the top of the window and to add some softness to the room. 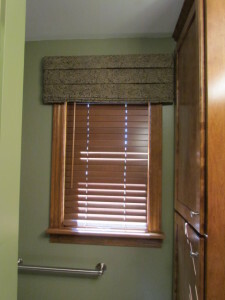 We also added a cordless 2″ wood blind from Hunter Douglas, and installed it inside the wood trim. This treatment had to be kept very close to the wall so the cabinet doors could open. The client was elderly so we added a decorative looking grab bar to the wall. If Traditional or Contemporary design isn’t your “look” why not try on Transitional Midwestern….as the Beach Boys say about the midwest… this may just “make you feel alright”! 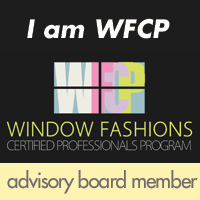 If you are not sure whether this will work in your home, I do provide consultations to come in and look. 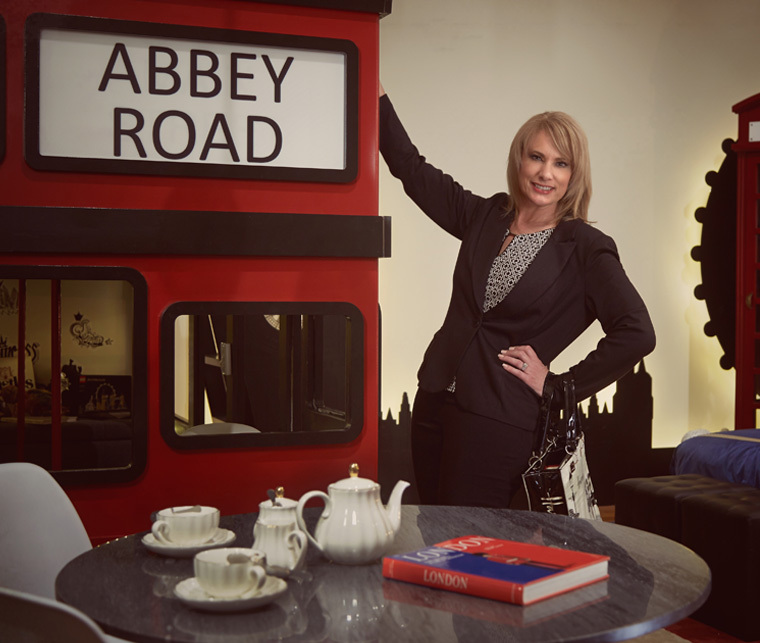 I’m sure we can find ways to transform your home into something you will truly love to life with!